On Thursday July 5th the June Class and Component Prices were announced. 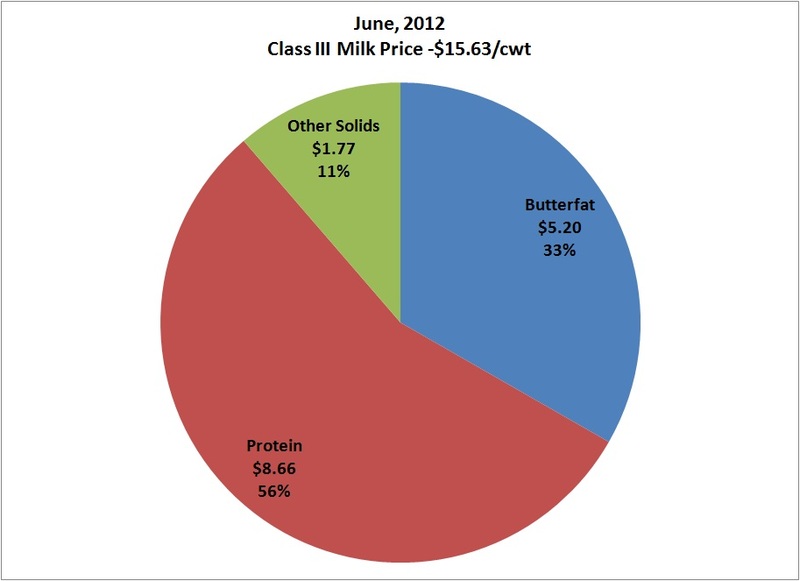 Class III milk prices rose to $15.63/cwt from $15.23/cwt in May, a 3% increase. Milk protein had the largest increase, up 6% in June to $2.90/lb. As predicted last month, dry whey continued it's price decline, down 7%. This brought "other solids" down to $.31/lb. as it returned to a level more the norm. 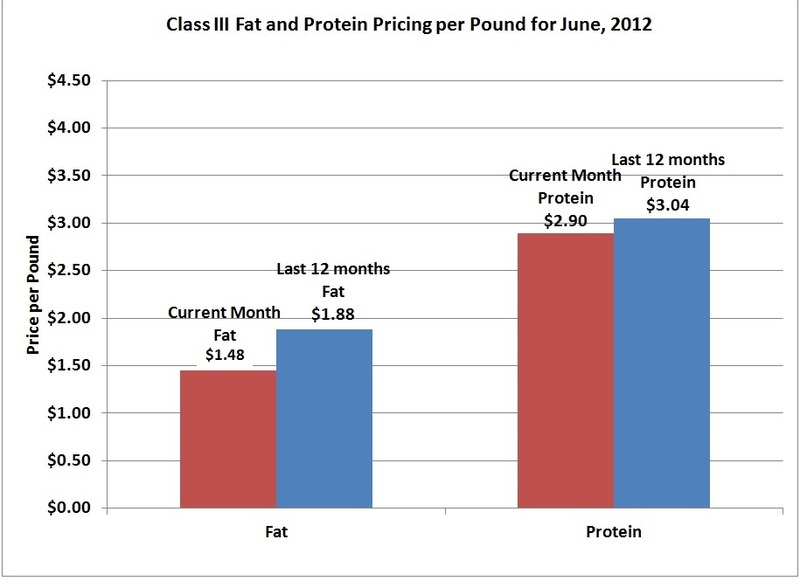 The pricing again favored protein as the key milk component in the Class III milk price. Payment for protein made up 56% of the milk check. This is based on the USDA parameters of 3.0% protein, 3.5% fat, and 5.7% other solids used in the Class III milk calculation. 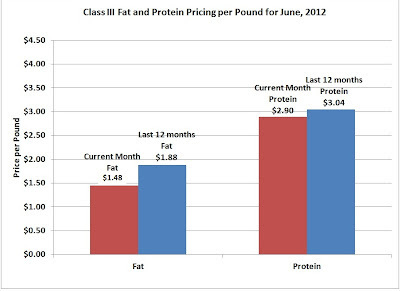 For dairy producers and nutritionists, feeding for high protein levels is clearly the best financial strategy, especially at a time of very high feed costs. 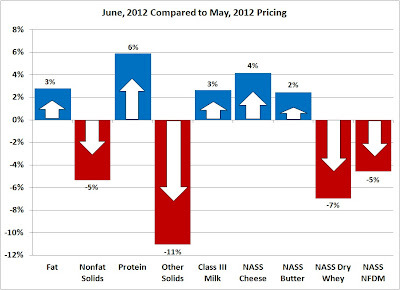 While it's good to see an increase in the milk protein and fat prices, the June prices are still below the averages for the last 12 months. Cheese parameters continue to look good for the future price of milk protein and the Class III milk price as detailed below. One of the most important elements is exports. 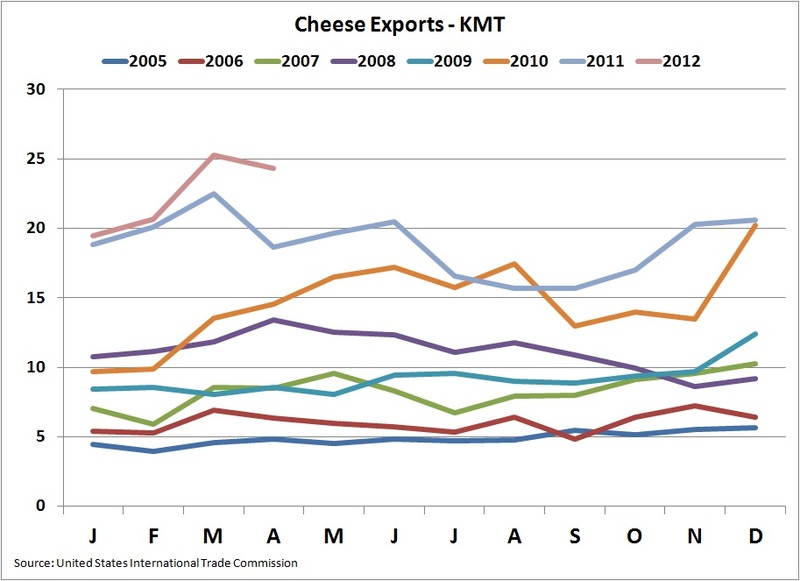 Exports continue to do well with cheese exports (the most important) setting records every month in 2012. The USD has remained at a fairly neutral level vs. other key currencies and the U.S. export assistance programs appear to be working well. 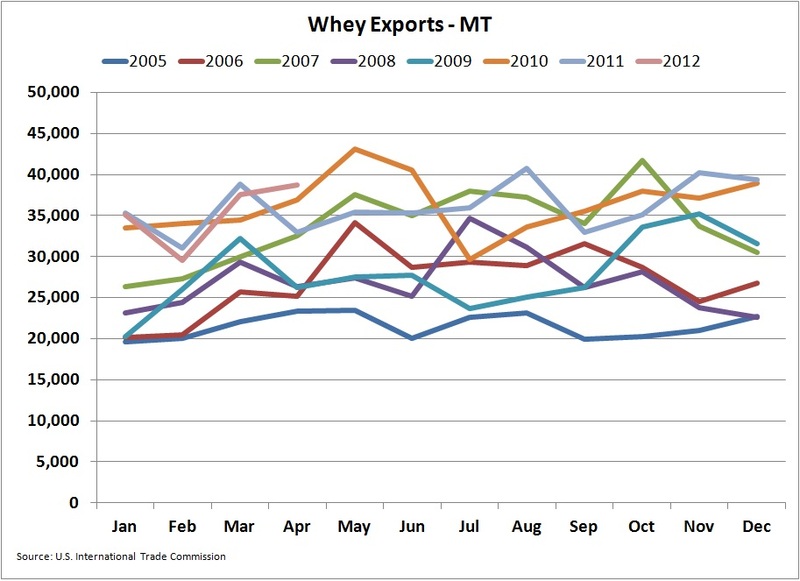 Below are the year by year charts of exports for cheese, butter, and dry whey. 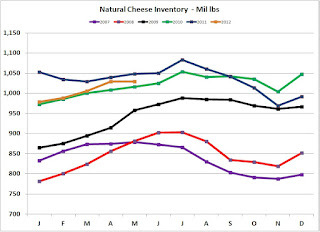 Cheese is clearly setting new records with new highs for April, the last month of available statistics. 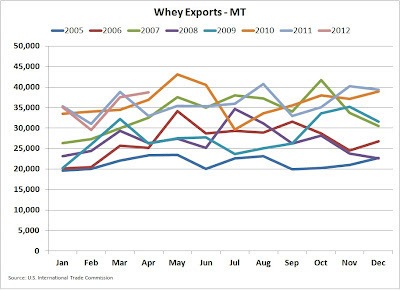 Whey exports are also doing well, but they are not as strong as the cheese records when compared to historical levels. 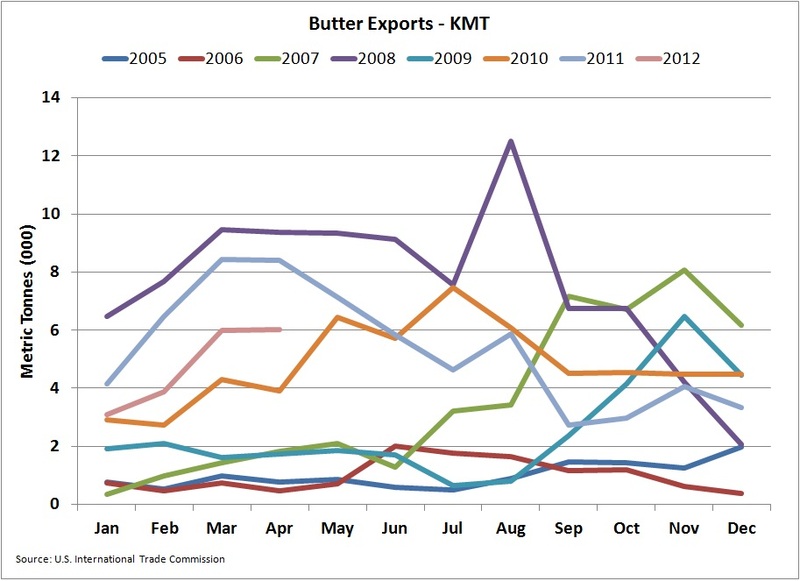 Butter exports are OK, but not record setting. 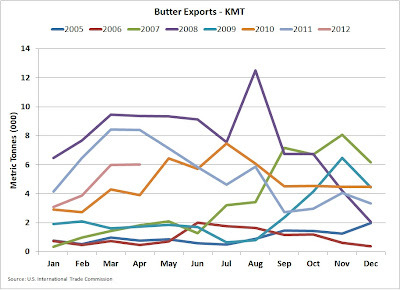 Exports are by far the most volatile factor on the demand side for cheese, butter, and whey. 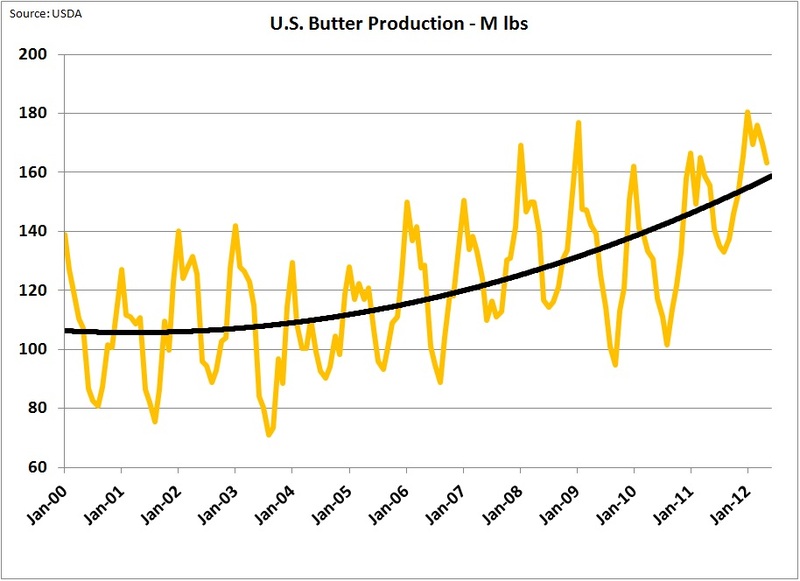 This is because the U.S. is competing with all the other cheese and butter manufacturers in the world. Therefore the ability to export is not just dependent on a cost competitive dairy model, but is also dependent on exchange rates. Many countries protect their dairy producers with supply side management and artificial prices mandates not based on open market conditions. The U.S. model may be harsh in requiring dairy producers to be very competitive, but in the long run it does produce a dairy industry that is very cost competitive. 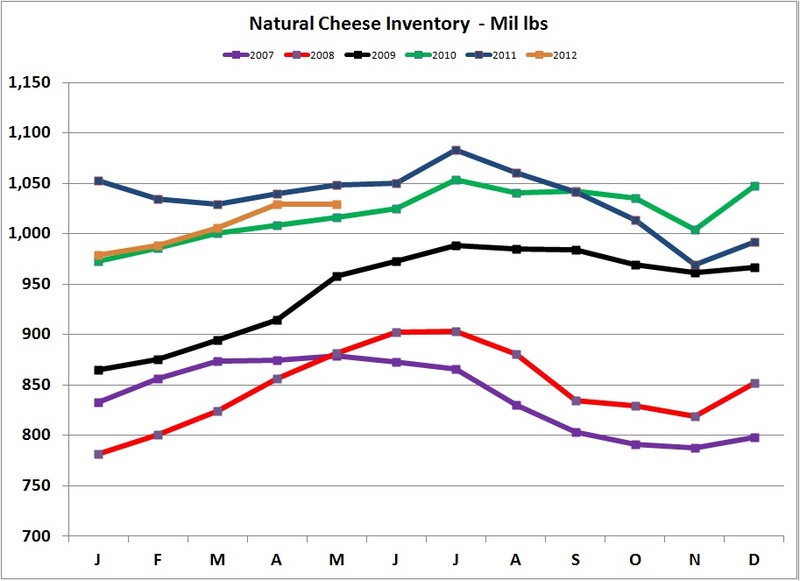 Cheese production remains robust, increasing at historical rates with normal seasonal fluctuations. 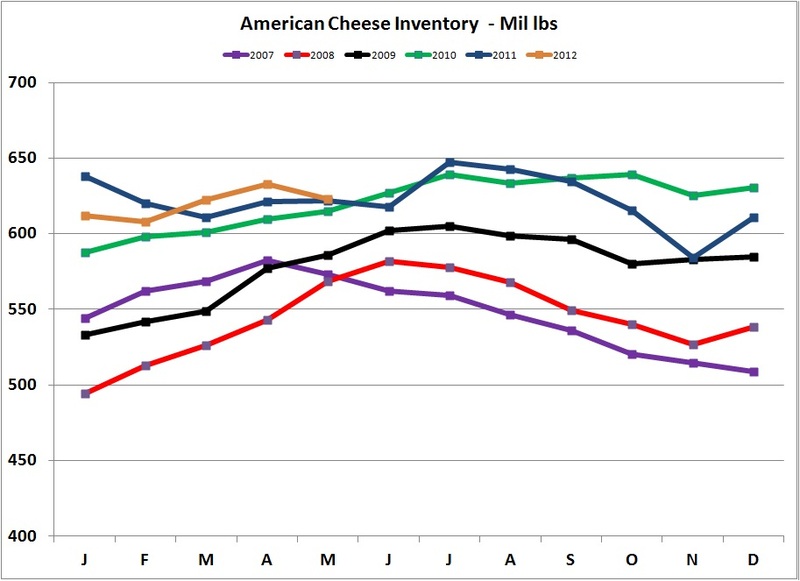 American and Natural Cheese inventories are at reasonable levels and follow the 2010/11 levels very closely. 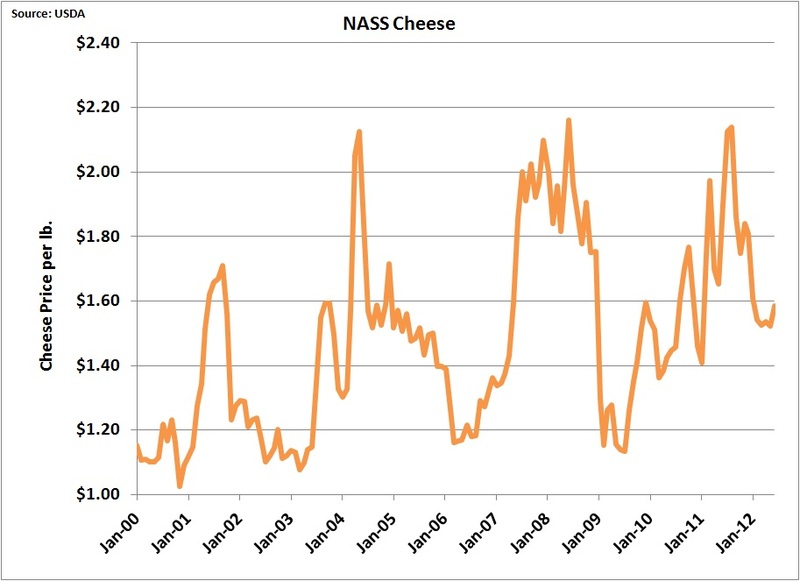 The NASS cheese price for June was $1.58/lb. For the last few weeks the CME cheese price has been in the $1.65/lb range. 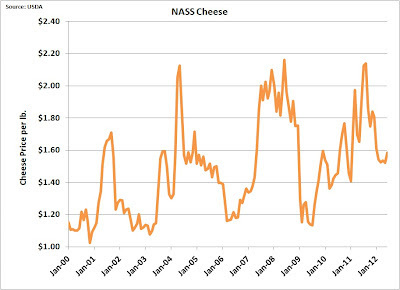 The NASS cheese prices lags the CME by about 2 weeks, so a higher NASS cheese price is likely for July. 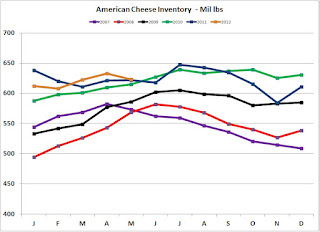 Cheese prices do have an upward trend and at $1.58/lb or even $1.65/lb further upward movement is possible. 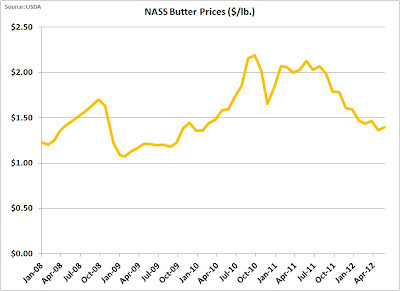 Butter prices have fallen and are not moving. 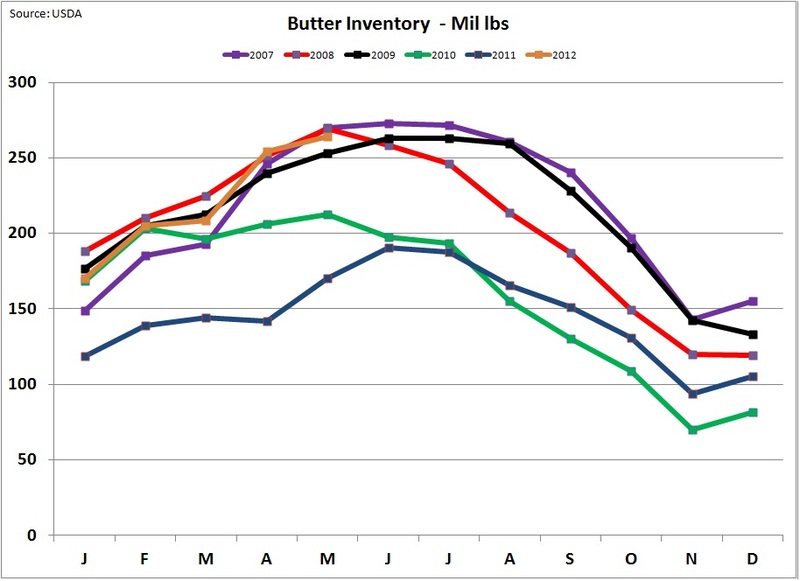 The current inventories are not exceptionally high or low, but exports (shown above) have not been robust. 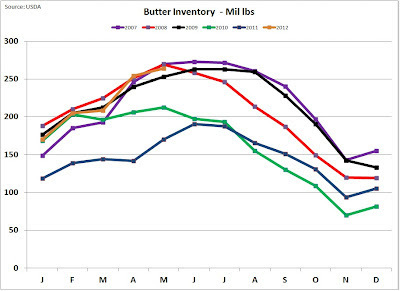 Current customer consumption of data is not available, but butter consumption is typically very stable. 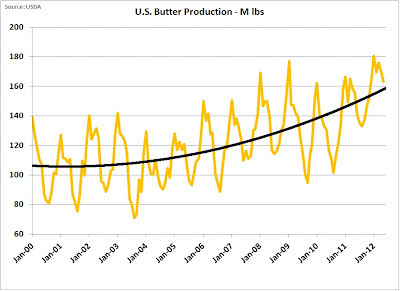 Butter production continues to rise, but not at exceptionally high or low levels. 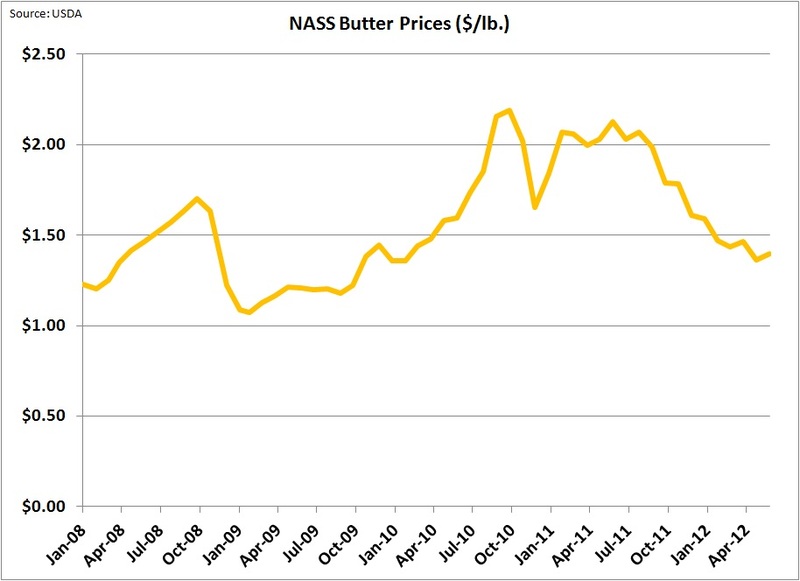 There is no evidence of anything that will increase butter prices in the near term. 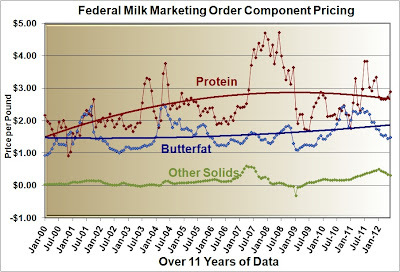 Dry Whey is the only variable in "other solids" pricing. 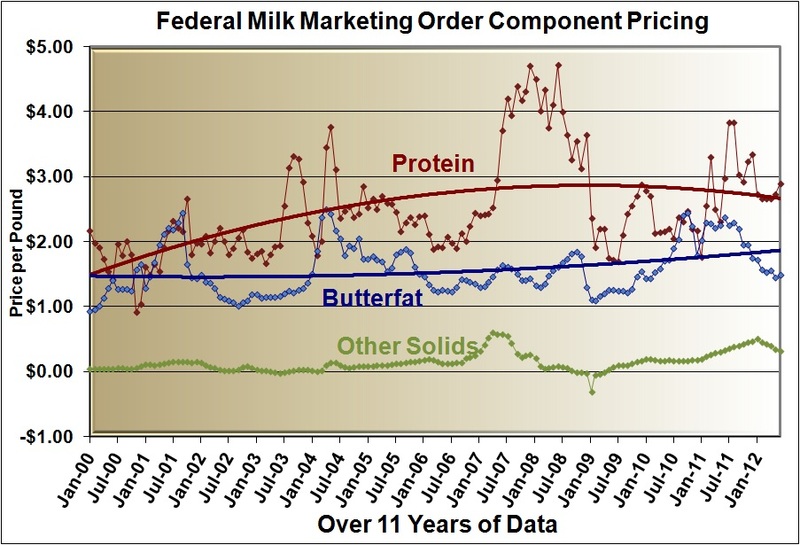 Because "other solids" has not been a significant Class III milk pricing element, it has not typically been reviewed in this blog. 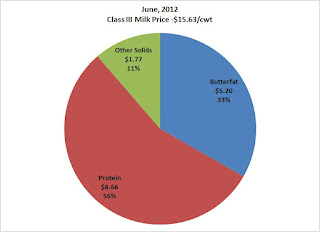 However, in the last year it has influenced the Class III milk price. 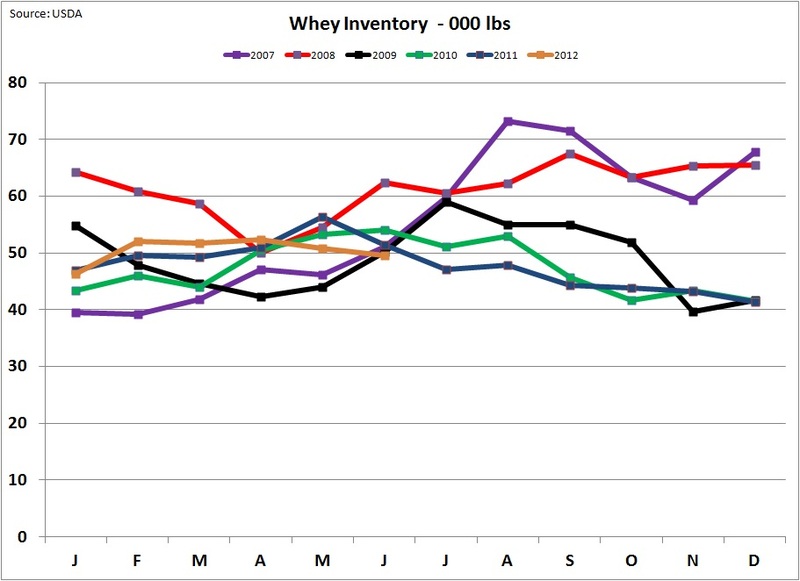 While prices have been falling for dry whey and exports have been rising slowly, inventories have not been building. This would indicate that further drops will be minimal. Fluid milk consumption continues to decline. There are too many competing beverages to expect any change in this trend. 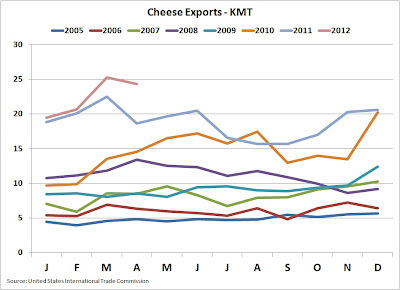 Exports are increasing in importance and the most valuable export is cheese. Water is not economical to export so dairy exports are isolated to products that use dairy components. 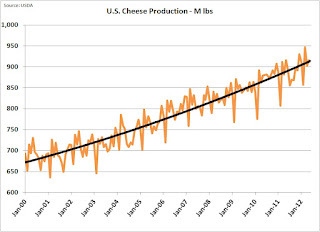 Cheese domestic consumption continues to rise. There is also a trend to lower fat cheeses. These trends are undeniable. Feed costs continue to rise with little hope of a major reversal. Cash prices for corn are currently over $7/bushel and soybeans are over $15/bushel. All these factors lead to one conclusion. The U.S. dairy industry must focus on milk protein. Where there is demand, good prices will follow.